This is a strange pick indeed. For one thing, it is obviously warped. For another, it has two different fonts on it. The underlying logo that I can see is the word 'TEXAS'. Printed over the top of that word are the letters 'PRB(or maybe PRS?)'. 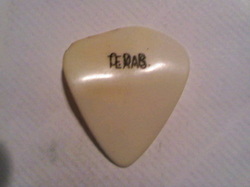 Any help in identifying this pick will be GREATLY appreciated! 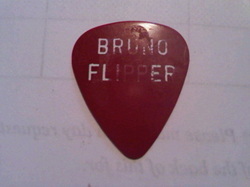 Red celluloid 'Bruno Flipper' in white printing. Unsure of this picks origin(I know there's a punk band called 'Flipper' and a band members first name is Bruno-but I don't know.